More than one person said to me when I confessed a desire to visit the Greek capital, “Oh, don’t bother with Athens; skip it and head straight for the Greek islands.” And miss the Acropolis? Arriving on a Sunday evening, I made a reconnaissance of the Plaka — the historic area around my hotel, the smart and perfectly welcoming Hotel Electra Palace. 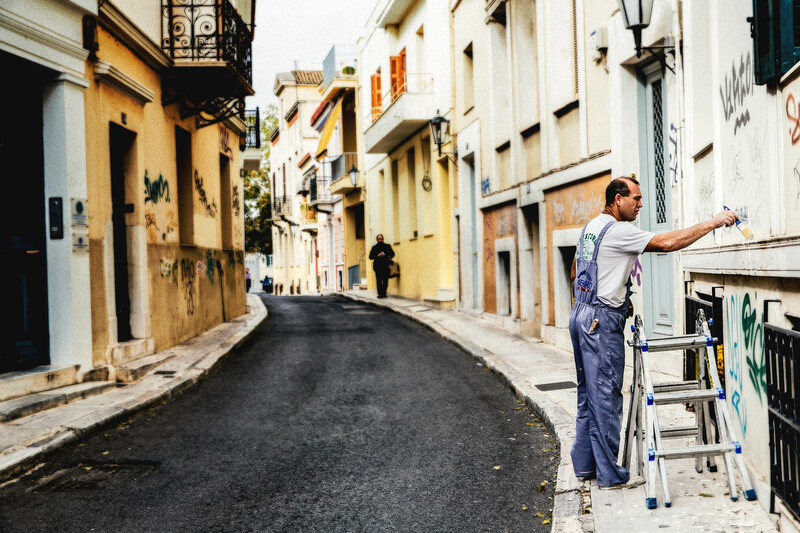 The Plaka is the oldest part of Athens, and its cobblestone streets curl around the foot of the Acropolis. This, of course, is a 2500-year-old citadel located on a rocky hilltop that remains home to several buildings of immense historic and architectural importance. The most notable of these is undoubtedly the Parthenon, resonating with aeons of civilisation and providing the physical and figurative centrepiece for anyone staying close to the city centre. Antiquity looms large, often quite unexpectedly, when one turns a corner practically anywhere in the Plaka. There is, for instance, the Lysikrates Monument — erected by, well, Lysikrates — to showcase an award he had won for sponsoring the most critically acclaimed plays of his time. A few blocks away, the pillars of a Roman forum offer a reminder that this most Grecian of architectural sites is also strewn with the remainders of other civilisations. Particularly notable is the Tower of the Winds, also constructed by the Romans, in 1 B.C. The figures on top of it once physically revolved, as the tower was a working hydraulic clock. 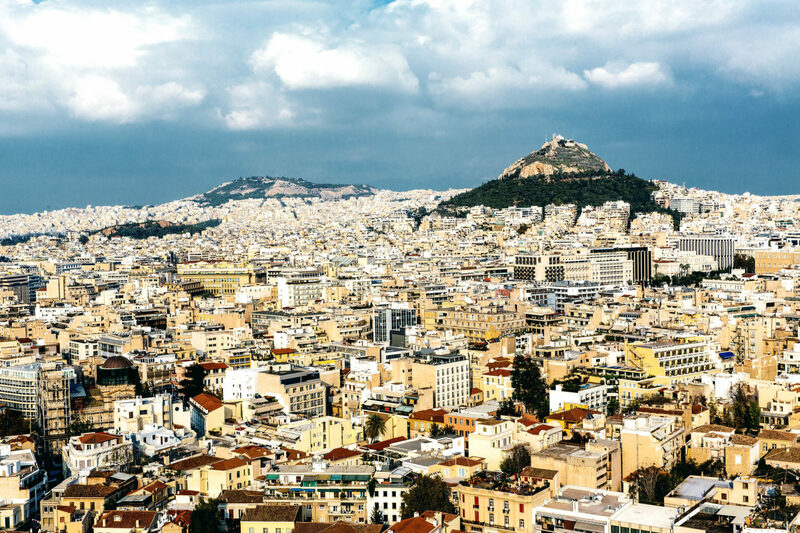 Downtown Athens is a mix of old and new, with both narrow alleys and wide pedestrian shopping streets dotted with historical ruins. After the Romans packed their togas and went home, the Ottomans occupied Athens for three centuries, leaving behind traces such as the Hamam Abid Efendi, a Turkish bath built in the 17th century. A few hundred metres away, the Gate of the Islamic Seminary is all that is left of an 18th century Ottoman building, its moss-covered doorway looking to my tired eyes like the portal to another dimension. So, after a drink at the pool bar of the Electra Palace, I was ready for sleep. Next morning, it was time to get out into the city again — this time, accompanied by my local volunteer guide, a likeable young man named Konstantinus. A winemaker and farming smallholder who gives up his time to show visitors around, he told me he was no history expert — and then proceeded to guide me expertly around the Acropolis. Briefly then, without getting too textbook about the whole thing: the word ‘acropolis’ means ‘city on the edge’. 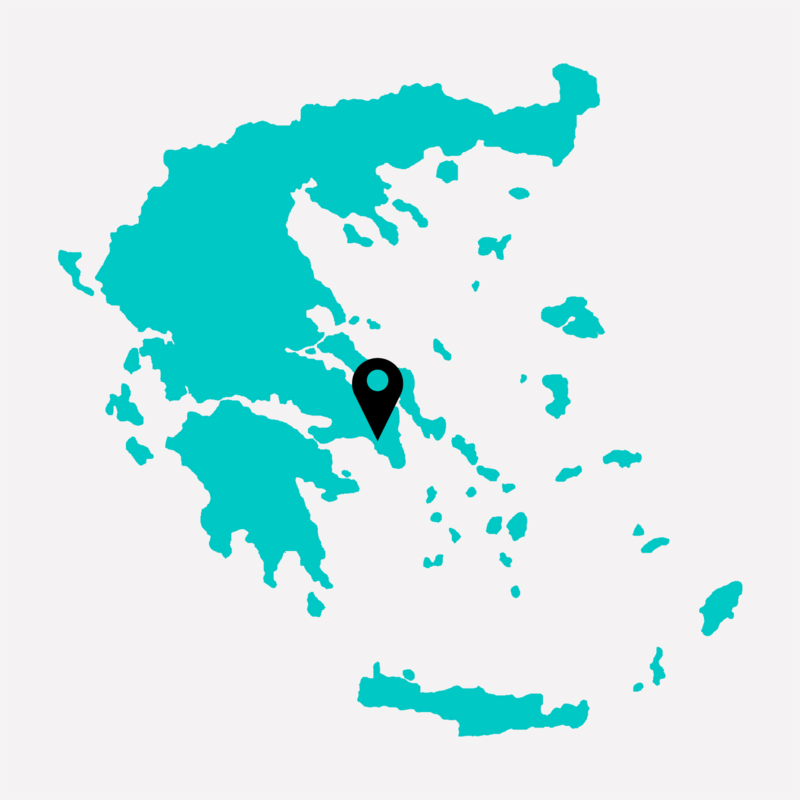 Though there are numerous other acropoleis in Greece, the significance of the one in Athens is such that it needs no further moniker. 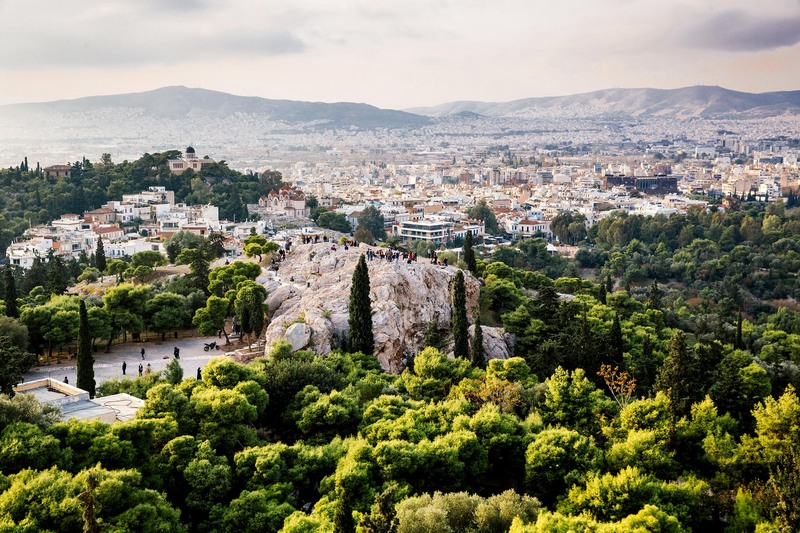 While evidence suggests that the hill was inhabited as long ago as 4000 B.C., it was Pericles, the so-called first citizen of Athens (circa 495-429 B.C.) who was behind the construction of the site’s most important buildings. We walked the long winding road uphill, stopping to admire the Roman Amphitheatre on the southwest slope. And then there we were, at the Propylaia, the steps and monumental gateway that lead to the plateau of the hill, providing the gateway to the Parthenon itself, the Erechtheion, and the temple of Athena Nike. 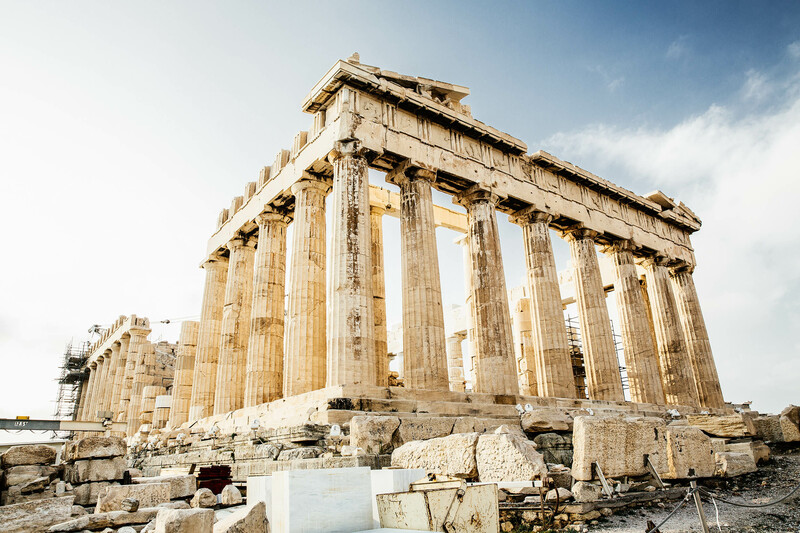 The Parthenon: one of the world’s most recognised structures and the centrepiece of the Acropolis. Looking back from this elevated podium, the vast white city of Athens stretches below, with its backdrop of mountains on one side and the Aegean Sea on the other. Even so, a few features stand out within this broad panorama: notably, the Temple of Zeus, and beyond it, the old Olympic Stadium, the Panathinaiko. These old Greek temples seem far more at one with the supernatural than anything constructed since. What’s more, the idea of many gods constantly at war with each other somehow seems fitting, aligned with human behaviour today. Not to play favourites, but I found the Erechtheion the most individually fascinating of the site’s buildings and structures, constructed as it was on the place where the goddess Athena caused her most sacred emblem, the olive tree, to grow. It’s interesting to note that the elegant maidens supporting the roof of the south porch of the temple are all copies: five of the original six statues can be seen in the beautifully designed New Acropolis Museum, and the sixth can be viewed in the British Museum in London, thoughtfully removed (or stolen, depending on one’s point of view) by Lord Elgin, who served as British ambassador to the Ottoman Empire from 1799 to 1803. 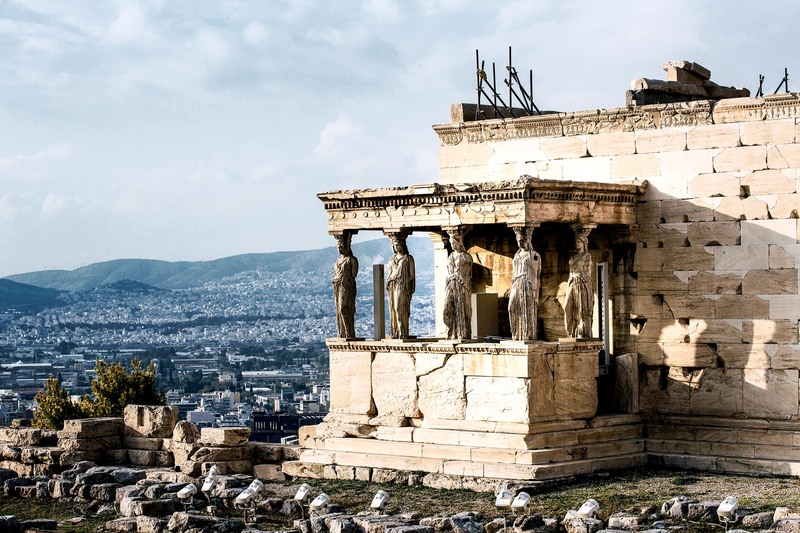 The Erechtheion temple honoring Athens and Poseidon, boasts the famous “porch of the caryatids” — six draped maidens that form the supporting columns. The next day, food, shopping and more sights were on the agenda, this time as part of a group bus tour. The route included a stop at the lemon-yellow coloured Greek Parliament building — as seen in recent years on BBC World News and CNN surrounded by protestors and riot squads — that I learned was originally built as a palace for a Bavarian king. From here, our bus took us to the Villa Illisia, which was once residence of the so-called Duchess of Plaisance, one Sophie de Marbois-Lebrun. It now houses the Byzantine Museum. This was followed by a whirlwind tour through the Museum of Cycladic Art, an incredible collection of Greek art and antiquities, then the neo-classical Athens Academy and The National Library. The latter is the largest library in Greece and we were only allowed to file through it in small, quiet, groups, taking as many photos of books, pillars and so on as we liked, but none showing the library’s denizens in shot. It’s a gorgeous temple of learning and repository of knowledge but by this stage I was building up a healthy appetite. Consequently, the food tour couldn’t have been better timed. Our guide was from Dopios, a well-run and staffed specialist tour operator, with local guides who will show visitors the spots that are hidden from most. Franco-Grecian Tina Kyriakis was our indefatigable guide through the many flavours of the city, and by the time we had sampled pastries, yoghurts, olives, retsina and feta, I was questioning the rationale behind my choice to live in Central Europe, with its goulash, pork and dumplings. 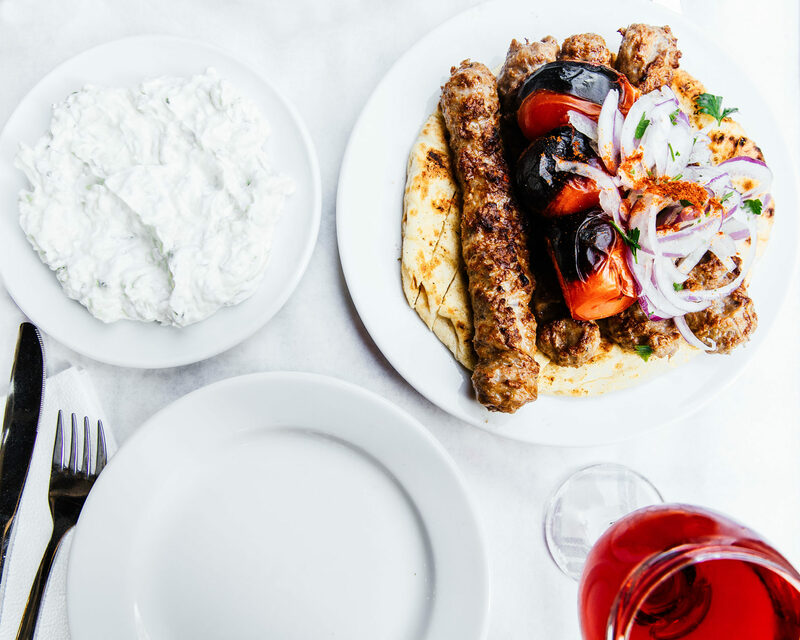 Athens is also a city known for its love of food — souvlaki, pitta, gyros and moussaka have all entered the common lexicon of international cuisine. In fact, I have never seen more types of olive oil for sale in one place than at Pantopoleio Mesogiakis Diatrofis. It has a lovely little tasting room out back, of which we took full advantage. Carnivores weren’t left out: we stopped in at one of the most visually arresting delicatessens I’ve ever seen, The Miran, which has been around since 1922. As an added touch, the vegetables sold inside The Miran are grown on a vertical garden suspended above its entrance: quite spectacular and innovative. After food comes shopping. Elina Yiannoulopoulou transmitted her enthusiasm and excitement about local designers to us, taking our group to the showroom of one handbag designer who had moved back to Athens and opened shop in the midst of the recession. Time and again I heard such stories, to the point where one has to be impressed by Greek resilience. We also admired the jewellery and silverware at Ilias Lalaounis, famous jewellers who have a museum in Athens and stores in New York, Geneva and Tokyo. Elina was a first class guide to the world of Athenian fashion and materialism, but she was also very knowledgeable about her native city. For example, when we passed by a tiny church, incongruous among the high-rise buildings around it, she casually remarked that it was from the 16th century, and that it had been home to many exorcisms. On the final day, we were picked up again by tour buses, which headed for the harbour and boat cruise. We sailed around Athens’ coastline on Brama’s Lepanto, a 13-metre catamaran. After a ‘second breakfast’ inside, we made our way up on deck, and as the Lepanto reached open water I was seated at the helm, enjoying the sea breeze and feelings of freedom. There were ample home comforts on board, and the spring weather was mild enough to ensure a very pleasant sail. Our final port of call was the Flisvos luxury marina, crammed with an unbelievable array of multi-million dollar yachts and launches. Visitors and locals alike settle among the rocky outcrops below the Acropolis to watch the sun set over Athens. On my final days in Athens, I roamed the streets, awed by the sheer antiquity of its many sights: a leftover bit of the old city wall here, the Temple of Zeus there. The Panathenaikon Stadium, which I had seen earlier from a distance, was spectacular up close. Although its design is 2570 years old, the structure of this original Olympic stadium is so streamlined and minimal that it looks futuristic. First built out of wood in 566 B.C., the Panathenaikon was reconstructed in marble in 329 B.C. due to popular demand, and finally made over again for the 1896 Olympics, the first modern Olympic Games.